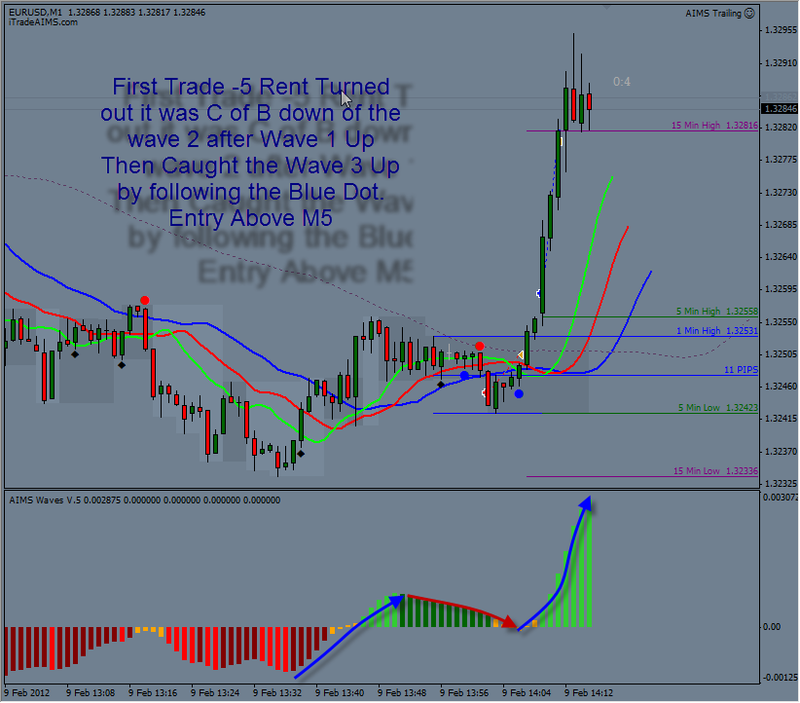 Here is a Trade Example on M5 for today. London Session was not much fun but in the afternoon just when the New Yorkers Entered the scene there was a lovely Setup on M5. It resulted in a total of 91 pips. Now that is equal to around 4% growth! Its been an interesting morning. Bit a patience and lots of discipline was required but then it took only 17 seconds only to raise my account by 1.5%. Had a stayed for 10minutes that figure could have hit 6% but I dont dwell on Coulda, Woulda, Shoulda! 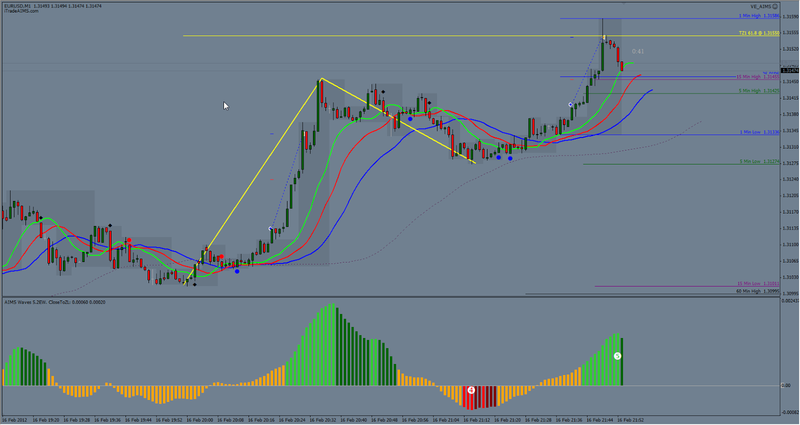 ps: at the bottom you may see our NEW AIMS eWAVE indicator which will show us Elliott Wave Count without the headache of counting! Coming Soon! I was out to see a friend and got late a bit. 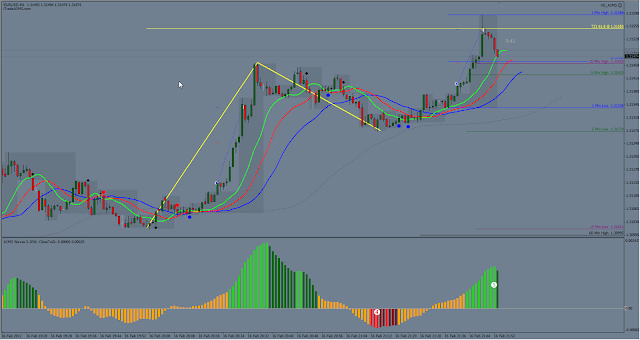 As I returned home and looked at the charts out of curiosity, cant sleep without having a look at charts, so I got this trade based on M5 Sleepy alligator. 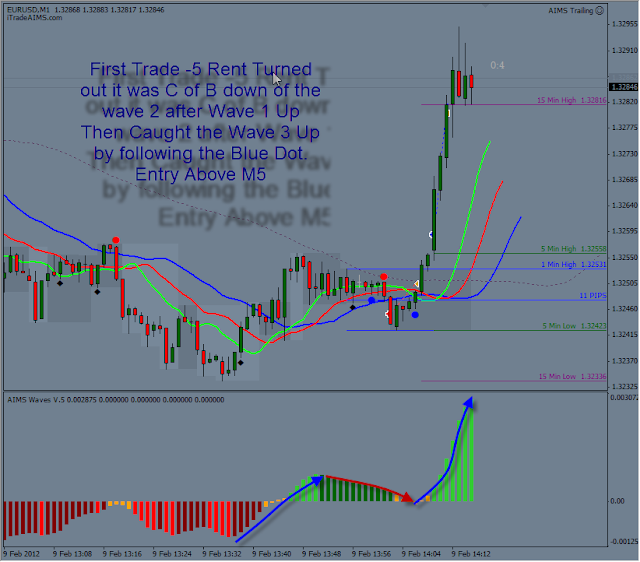 This was not a pink dot trade rather a trade off the Saddle point on m5 but timed on m1 for entry and exit. Today, Had a Rent Trade followed by a 20 pipper. Paid a couple rents earlier too because of a couple of not very disciplined trades. So Up .5% for the day so far. Lets see if we can make that a 2% day today! Whats New in V 5.1 Upgrade? We’ve tried to reduce even more stress from trading by improving the AIMS Entry Alert indicator. • Pink and Green – Type 2 Buy and Sell Alerts where AIMS Box and AIMS Wave meets the set criteria. Wait for a new AIMS Box and place PO. • Black dot (well, it’s actually a diamond but you can change this) – a signal where Purple is on the wrong side of the AIMS Box (not wrong side of price as in V5). Consider exiting a trade or cancelling a PO. • Powder Blue dot – an alert that hasn’t met your criteria as regards the size of the AIMS Box or size of AIMS Wave. You might still decide to trade this dot, if you feel the conditions are right – that’s your decision. You can choose not to display this dot. You can of course change the colours of all the dots. 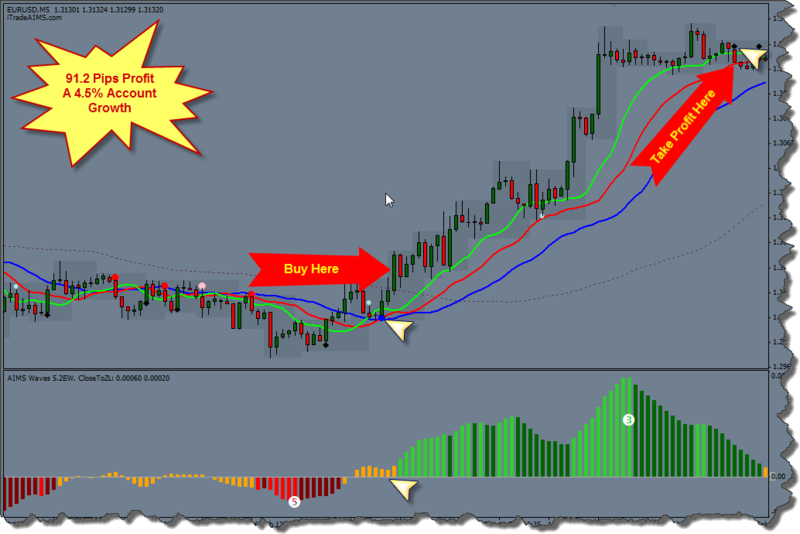 Only the valid buy/sell alerts will generate a pop-up/sound/email. The logic for the alerts has been improved to give more timely signals. You might notice that some dots will disappear (otherwise known as repaint) when you refresh the charts but don’t be concerned by this. We had a choice when developing the indicator: give the alert one bar late, to avoid the repaint, or show it early. Providing you follow the trade rules, the repaint will not be an issue for you. We’ve also made some programming improvements to the AIMS Box and AIMS Waves, to reduce processor overhead. 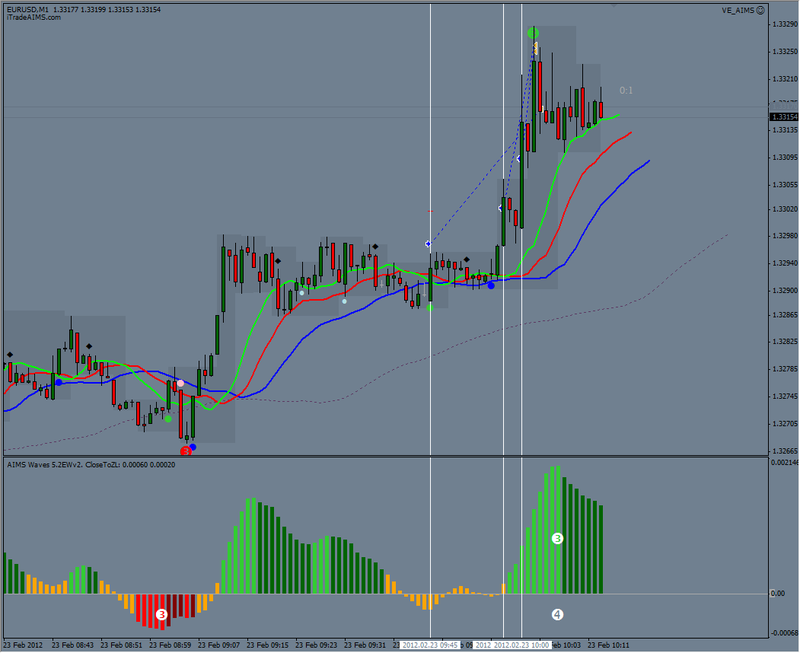 The AIMS Boxes will be removed when you remove the indicator from your chart (V5 left them behind). There are two new templates for M1 and M5. M1 has the default settings that the AIMSters have been using whilst trialling these new indicators. M5 doesn’t have alerts or the VE-AIMS trade manager. We’ve increased the setting for ‘close to zero’ on AIMS Waves – 0.0006 seems ideal for London and US Sessions when volatility is relatively high. You might want to use lower settings for quiet trading times, such as Asian markets. 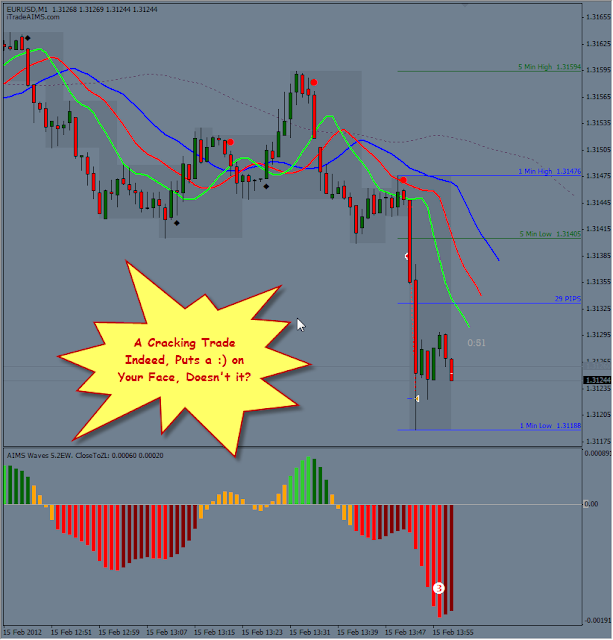 If you trade the Yen pairs or higher timeframes, you will need to change CloseToZL to suit. We hope you like the new indicators and they help you make even more pips than before. We have endeavoured to make trading even more stress free and emulate Grant’s excellent flow chart – less scratching of heads and more banking of pips.